A couple of years ago, I began the tradition of making homemade ornaments every year. Last year I posted my Homemade Block Ornaments. This year…I used metal juice can tops to make our ornaments. 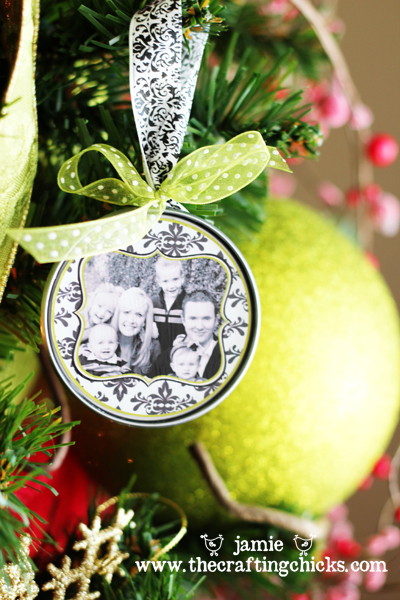 On the front of each ornament is a photo and on the back is a little something about that person. For our family ornament, I added our 2010 highlights of the year. These will be so fun to read each Christmas in the future. I love how they turned out. To get started, cut out your circle photo, front and back. Then I used mod podge to glue the photo on to the juice top. I also applied a thin coat of modpodge over the photos to create a seal. The photo should be placed on one side of a juice top, and the back photo/wording should be glued on the back of the juice top. That way they will fit correctly when it is time to glue them together. Before gluing, figure out how to make them fit and which sides to glue photos and backs on. Let them dry for a couple of hours. While they are drying you can cut your ribbon. You will need 4 inch or so strips to create a loop for the ornament to hang. While the ribbon is in a loop (just how you want it), glue the ribbon on one of the insides of the juice top. Next, cover one juice top inside with hot glue and then put the two juice tops together, the front and the back. Squeeze tightly to glue it together well. To finish these off, I added some polka dot ribbon and ric-rac to the ribbon loop. And there you have some very cute photo ornaments with photos of your favorite people in the world! How about a berry wreath? What are some Homemade ornaments you have made? We would love to see yours too! And if you like these ornaments, how about these juice top magnets. Wouldn’t they make a cute gift? Oh my gosh! I have no words for how cute these are. 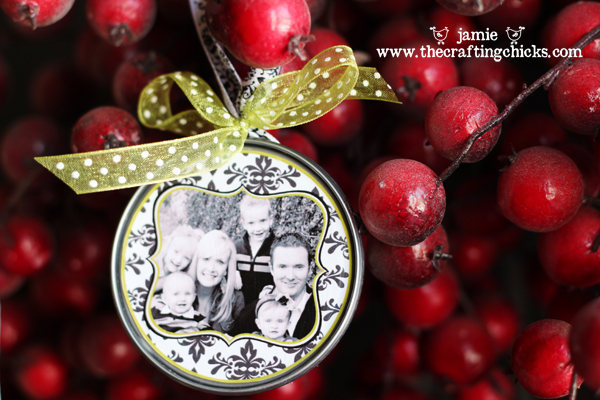 LOVE these ornaments — they are so cute! 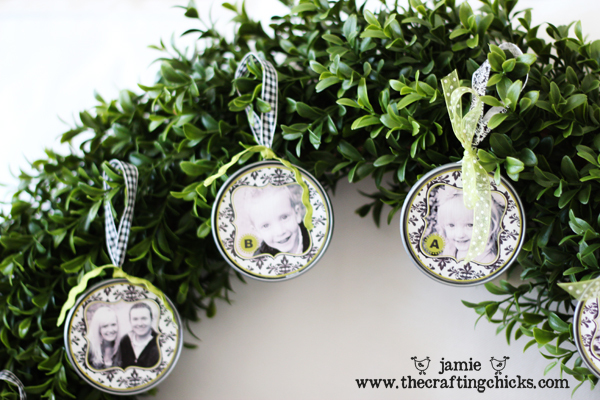 Jamie, I LOVE these ornaments! Simple and DARLING!! 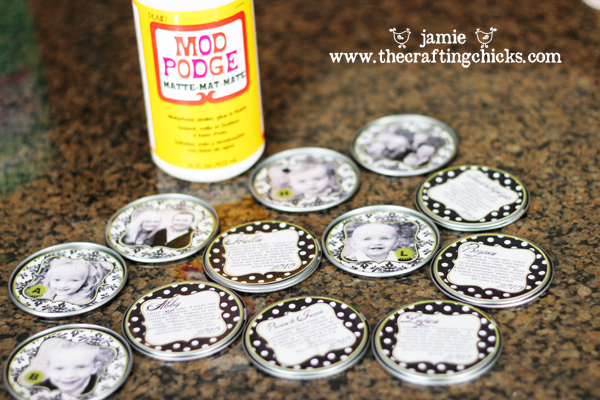 These are perfect – I’ve been saving my juice lids for a project! Thanks for sharing. Any chance you could share a file that has the circles laid out? Just the size of the circles would be fabulous and save a lot of time. I don’t need the effects. Are these from the canisters of juice concentrate that you add water to? I’m a little confused. Doh! Found it on the magnet blog you linked to. So glad that I am not the only crazy one that saves juice lids! Thanks for taking these utilitarian objects and making them look so elegant! Great tutorial. Super love these. Can you tell us what Digital kit you used for the paper. Love the frames, but wanted the paper as well! Those came out so cute! What a great idea. Thanks so much for sharing, I’ll be linking. I am also wondering how to digiscrap the circles. I downloaded the Artisan Label Templates but am having trouble with the circles. Thank you. Those are so cute! I am going to feature them tomorrow! I work in an elementary art classroom and we had these (provided by the other art teacher or I’d totally take some and use ’em to make these photo ornaments!) and we allowed the kids some freedom to make whatever they wanted. Kids come up with some great ideas! One kid made the juice top the belly of a Santa and made the Santa with colored paper and accessories (including an acorn for part of his hat). Some of our students used them as the floor and glued a pinecone “tree” on top then put paper around the bottom for a tree skirt and decorated with glitter, markers, etc. I don’t have pics, but I’ll try to get some by next week! These are the cutest things!! 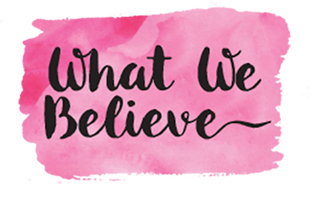 Like those above, I am wondering if you would share the size of the circles (or a template) and what kit(s) you used for the polka dot paper? Thank you so much for this great idea! These are such fun things. They don’t even look those old simple homemade things from years past. They are great for using digi scrap supplies, as well as paper supplies on hand. I cannot tell you how in love with these I am. SO CLEVER!!! We don’t drink juice so I’m going to have to figure out an alternative for the lids, but I just love the use of hybrid scrapping on these. 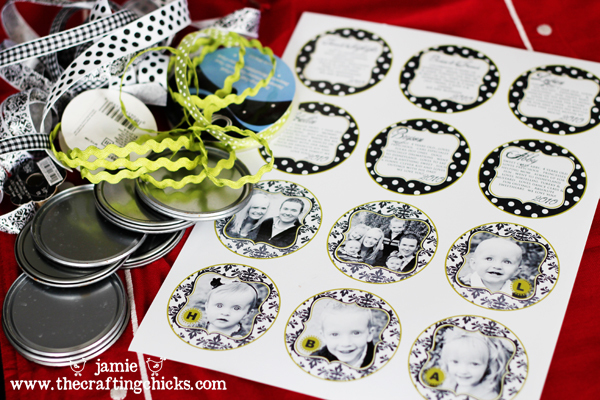 Love the highlights for each person and the Crystal Wilkerson templates. Just love it all. Thanks so much for sharing! Ok I’m new to this so I have a question about the “digi scrapped?” How exactly do you do that? Thanks! All I can say is WOW, I love your ornaments, I loved them so much I HAD to make a set for my Mom on Christmas Eve (http://www.crafterella.com/2010/12/holiday-photo-ornaments.html) Thanks sooooo much for the instructions and the inspiration! They’re beautiful. i’ve never seen tops like this in the UK, otherwise I’d def have a go ready for next Christmas. These are adorable!!! I’ve been saving lids and looking for ideas on how to use them!! Time to get busy and make as many as i can for our troops this year!!! We only need about 15,000 ornaments!!!! These are absoultely gorgeous!! LOVE them and what a great idea to recycle those juice lids!! Will definitely be giving these a try! 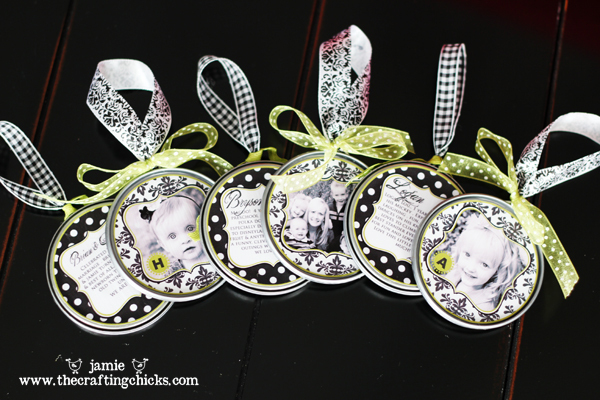 I like to make mini scrapbook star albums with photos of the kids/family and hang them on the Christmas tree. I LOVE these! I was wondering how you kept the edges of the lids from being sharp? I just purchased the templates that you listed t make these… I have NO idea how to use them like you did. Can you let me know what type of label you bought and what you did to get the picture inside the frame? I thought they were different. I wouldn’t have bought them had I known no instructions would accompany the download. I have the same problem as Summer. same problem too. guess i should have read all the comments before purchasing the templates. would you please tell me how i can use these? i really wanted to make ornaments for my kids as a christmas present! You will need to pull the tags into a program like Photoshop, they might even work in Word. Pull the image in a program and then you can add the words that you want. I’m not sure you can add the pictures when you are in Word, but you could try. These are so fun and if you do get Photoshop get Photoshop Elements. Cheaper and more user friendly. I love thee! I am going to design and make my own for my family. What size will the circles have to be though? Do I just print until I have the right circles if I am not going off the website you gave? These are so cute! I featured them on my blog: http://www.organizinghomelife.com/archives/1023 Thanks for sharing! Hi! 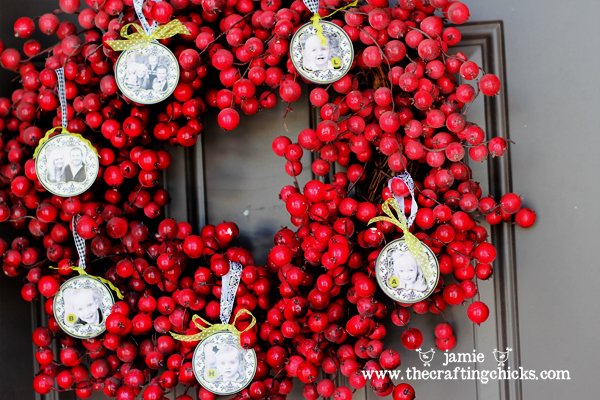 I LOVE this idea and I’m so excited about making these for Christmas this year. I have a question though…..how did you create the circle to fit exactly into the lid? I use photoshop elements for my digi scrappin. Thanks! Very nice idea. So original too. The lids are really sturdy and I have always thought it was such a waste to throw away (even if you recycle). Jamie, I LOVE these! It’s tradition in our family that we make ornaments and give out with our gifts each year. I want to make these this year but have no clue what you mean by digiscrap. I have purchased the template but don’t know how to make them cute like yours. HELP! Love these! 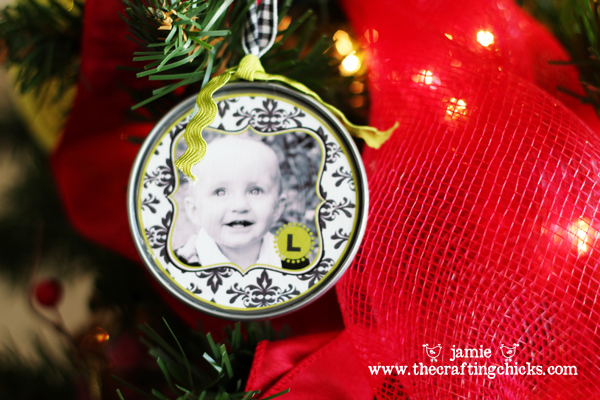 I featured them on “Top 10 Ornaments to Make” @ http://www.cheapcraftymama.com! Feel free to stop by and grab a button to show that you are featured! I love these ornaments! I am also wondering if you could explain the digital scrap booking portion…I have photoshop but can’t seem to figure out how to start. Thanks! wow that is so smart & cute & it looks flawless! love these! What a great idea! I love the borders you put around the photos. Looking forward to creating some of these! Thanks! These are so cute! What a great use of products! What adorable and creative ornaments!! I love them! Awesome way to use juice lids… wow! Could you share how you made the circles & digiscrapped the frames? Adorable but can’t figure out how to get the circles sized. Thanks! I’m late to the part! A) I’m a retire Redesign Decorator, but I’m going to set mason jar lids, SPRAY paint!! ( yes I have your pointers, add some glitter while wet, now, all I have to figure out is how to put borders around….thinking I may, for this year anyway, use hot glue and put lace,artificial. Snow, something! Ideas for a newbie? Chri is close!! 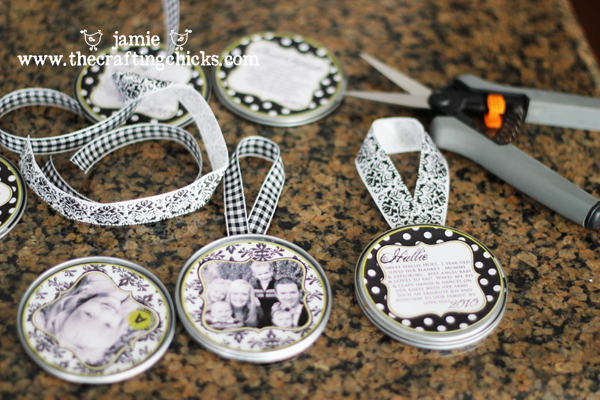 I am also going to use mason jar lids………but I am going to use the circle sticker templates from Avery to do it. I really like your picture ornaments, but I wish you would have demonstrated each step instead of just showing your pictures and talking.Please don’t take offence but some of us have to be showed each step or we don’t get it. Thanks!